An enormous part of the SMX Convention Centers’ success has come from the excellence of our highly-trained, dedicated service professionals—just as we, in turn, are dedicated to each of our staff members’ individual success. Through a specialized customer service module we call “We Go Beyond”, the trainees are prepared for a thriving and rewarding career in the Meetings, Incentives, Conventions, and Exhibitions/Events (MICE) industry. Patterned after the training programs of 5-star hotels and international convention centers, this module equips SMX personnel with the knowledge and skills to deliver exemplary customer service to every single client. Join the SMX family now. 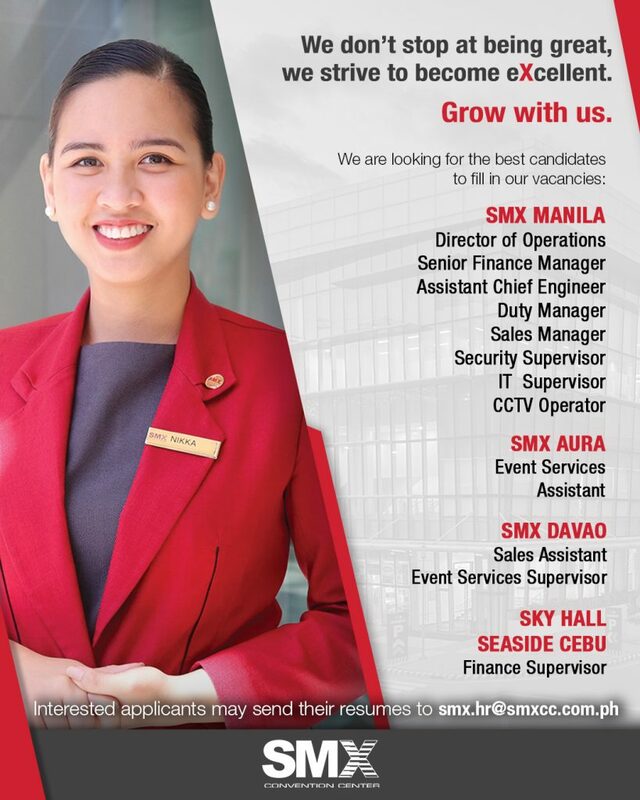 Email your resume to smx.hr@smxcc.com.ph.